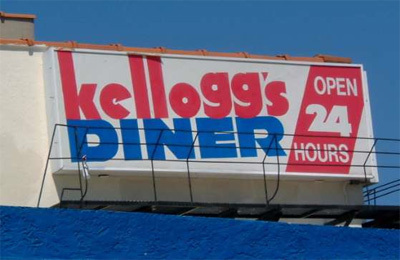 Forget Con Ed, Time Warner Cable, and Verizon — the one true monopoly in Williamsburg is the Kellogg's Diner. It's the only place for miles around that's open 24 hours a day seven days a week. Being a night owl the diner has always been a guilty pleasure of mine, it's never been about the food but being able to escape an apartment at 4:30 am. It's also a great place to people watch and it's the spot for hipsters to hang out after clubbing. So I'm sitting there today and I notice that the entire deli wing of the establishment has been walled off — it seems the diner is planning some renovations to upgrade the place (including the quality of the food from what I understand). What scares me is that there is suppose to be a short period of time (I was told maybe February) when they'll close for a while and gut the interior. The only thing that makes me nervous about this is that sometimes an establishment can go under, so I'll be keeping my fingers crossed. I also hope that when they come back they stay open 24/7. In the meantime if you want to see their vintage bicentennial decor while enjoying the most greasy onion rings in all of Brooklyn you better get over there. Photo found via the chomper. This page contains a single entry from the blog posted on December 24, 2007 6:26 AM. The previous post in this blog was Pulp Fiction in Typography. The next post in this blog is A Williamsburg Christmas.